As a horse owner, no matter where you’re working, it is always important that you do what you can to protect yourself and your horse. If you’re looking for a way to do just that, then a few portable run-in sheds from Deer Creek Structures would be a great investment for you. 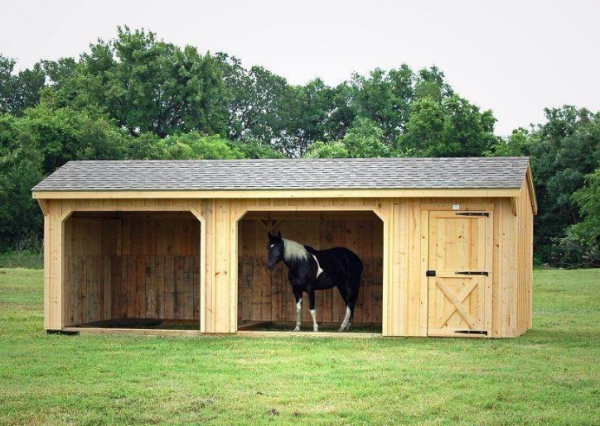 Our sheds are perfect for keeping you and your horse out of the elements. Whether as a convenient resting place located on your property or along a trail or a structure on the far side of a riding pasture or field, adding sheds gives you the option of numerous places to escape from the sun and elements when you need to. If it is a hot, sunny day, you and your horse can walk into the shade of a conveniently situated and relax for a few minutes. While in there, you can both cool down and enjoy a water break during your trek along the trail or as a reprieve during your training runs. Also, by having more than one shed and using them at different places on your property, you can set up designated rest spots throughout your training fields or along your trails to make sure you take enough breaks and don’t overwork yourselves. The weather can be unpredictable sometimes, and a nice sunny day can quickly turn to random rain showers and thunderstorms. If you and your horse are out working on your property and this happens, you could go to your nearest shed and wait for the shower to pass. It’s not fun working with wet clothes and the shed will give you shelter while the showers pass. Once the weather has stopped, you will still be dry and can get back to riding comfortably. The portable run-in sheds from Deer Creek Structures come in three different sizes – 8 feet, 10 feet and 12 feet – allowing you to pick the right sheds for your property depending on how big your horse is and how much room you need. If you’re interested in adding some portable run-in sheds to your property, let Deer Creek Structures help you find the right ones. Located in Lott, Texas, we also offer quality horse shelters and barns that give your horse a place to sleep at night. For more information on our structures, call us today at 254-546-2276!